Mercury bicycles were not sold directly to the public, but were only made for the government as military roadsters, for export, or supplied to the cycle trade. Mercury had the contract to build cycles for Cyclemaster Ltd. So a Cyclemaster engine in a Mercury frame is an interesting original pairing. 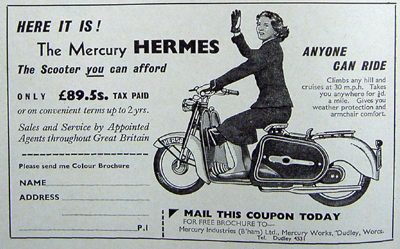 A Mercury Ladies bicycle that was originally fitted with a Cyclemaster engine is especially rare. This bicycle is complete, and ready for restoration. But the engine is not in good condition and will need to be totally restored or replaced. 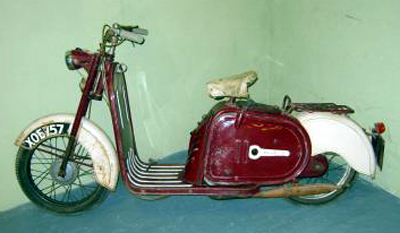 Above is an unrestored Mercury Hermes scooter; it came from the Combe Martin Motorcycle Museum in North Devon, which closed down some years ago. I owned it for five years before selling it. Below is a restored Mercury Dolphin (photo on my stand at the Vintage Motor Scooter Show in Coventry, Spring 2008). This is also now sold.